Ever dedicated to the needs and desires of the individual, China is now experimenting with projecting the texts of audience members directly onto movie screens, thus liberating all from the oppression of entertainment. The Hollywood Reporter says theaters in Beijing, Shanghai, and beyond are currently testing this new system as a way of encouraging younger audiences to come to theaters, where texting, talking, and, presumably, attending to virtual pets so they don’t become vengeful ghosts is already the norm among China’s modern, cellphone-toting audiences, who bravely stand up against the regime of paying attention to something. But now those texts will be laid directly on top of whatever movie the theater is attempting to force on its ticket-buyers in a testament to the individual’s right to be heard, constantly, like a modern-day Tiananmen Square. 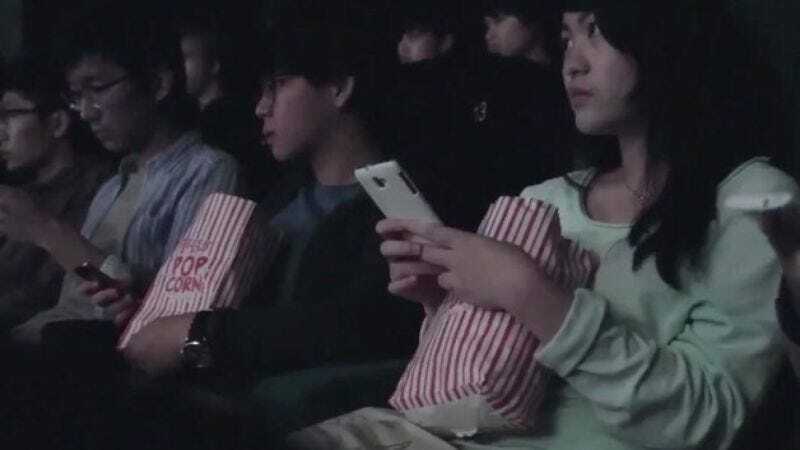 Dubbed “bullet screens,” after what they would be filled with in certain pockets of America, these theaters are meant to mimic the experience of watching films on mobile devices while sending out real-time comments to your friends—which is how most young, progressive Chinese people avoid absorbing the dogma of pop culture. Like most revolutions in their early stages, so far, the reaction has been mixed. Some have argued that “it interrupts our independent thinking and affects our concentration,” likely because they are working for the tyrannical entertainment dictatorship. But others like Shen Leping, director of animated movie The Legend Of Qin, sees this as a great stride for egalitarianism that’s “putting the director and viewer on equal terms,” and guaranteeing their equal right to put whatever crap they want up on screen. “It is just like when popcorn got into cinema for the first time, a lot of people protested that it would affect the film viewing experience,” said one fervent supporter, as an example of the kind of unfiltered, independent thought you can now see broadcast in big letters at the Chinese multiplex. As of now—other than a few flashes of rebellion occurring at Hecklevision screenings, in the liberal hotbeds of Austin and Portland—America remains sadly under the iron rule of Big Movie Theater, which kind of, sort of discourages texting. But perhaps someday we can take inspiration from freedom-loving China, and liberate ourselves from having to watch a whole, entire movie without our every fleeting thought being put on a pedestal for all to see.